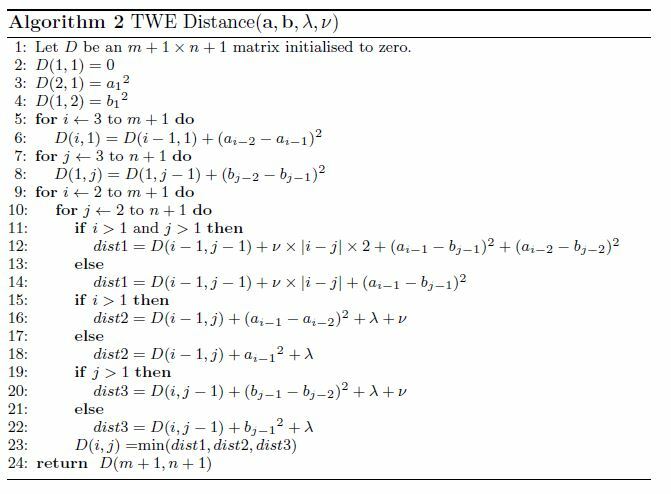 Description: Marteau propose the TWE distance, an elastic distance metric that includes characteristics from both LCSS and DTW. It allows warping in the time axis and combines the edit distance with L$_p$-norms. The warping is controlled by a stiffness parameter, $\nu$. Stiffness enforces a multiplicative penalty on the distance between matched points in a manner similar to WDTW. A penalty value $\lambda$ is applied when sequences do not match (Algorithm 1).